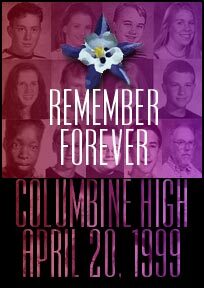 This page is dedicated to those who lost their lives at Columbine, those families who lost their loved ones, the students who attended Columbine and the community. On Tueday, April 20, 1999, two Columbine High School students shot and killed 12 of their classmates and one teacher - the largest school shooting in U.S. history. The Ones We Lost: Cassie Bernall, Steve Curnow, Corey DePooter, Kelly Flemming, Matther Kechter, Daniel Mauser, Daniel Rohrbough, Rachel Scott, Isaiah Shoels, John Tomlin, Lauren Townsend, Kyle Velasquez and Dave Sander. I live in Aurora Colorado, about 20 minutes from Columbine Highschool. On April 20th I walked into the breakroom at work and I saw on the news that there was yet another school shooting. What I didn't realize was that it was so close to home. This is a tragedy that I will never forget. The United Way "Healing Fund"
The LMC Community Foundation "Jeffco Safe Students Fund"
The Jeffco Schools Credit Union "Columbine Memorial Fund"